Kyiv Boryspil Airport (KBK) - Complete guide. Kyiv Boryspil airport is the main airport in the country. Most international flights to Ukraine arrive here operated by few dozens airlines and you’ll probably stopover on the way to other Ukrainian destinations unless your flight is direct. Together with Zhuliany airport, which is also situated in Kyiv, Boryspil serves more flights than all other airports in Ukraine in total. 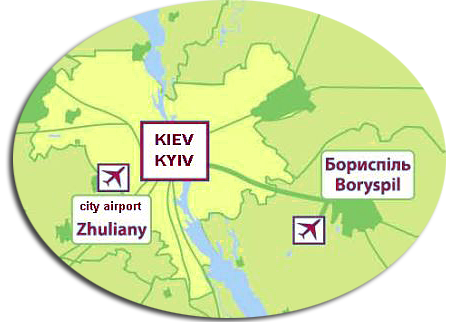 Kyiv Boryspil airport is situated 20 km southeast of Kyiv and 30 km away from Ukraine capital’s downtown. So what are the options of getting to the city and back? 1) Shuttle bus “Skybus” is the cheapest and very convenient way. It runs 24h, every 10-15 mins during day time and every 30-40 mins at night between airport Terminal “B” and south terminal of Kyiv central railway stationwhich takes approx. 40 minutes. The bus also stops at Kharkivska metro station. Get out here and take metro if you want to go straigt to Kyiv downtown. Check out Kyiv map for directions. Tickets cost 25 UAH to train station and 20 UAH to Kharkivska metro station. Even though you can buy them on-line there is no real need to do so, because buses run very frequently and the price is the same whether you buy the ticket in advance or on board from the driver. NOTE!!! In the airport on your way to the shuttle bus you might be offered to take“unofficial buses” that operate without a schedule and leave as soon as they get filled. Cost might vary as well. We all love it 🙂 If you’ve passed customs officers it doesn’t mean you’re already in Ukraine. A taxi driver is your opportunity to practice your bargaining skills. Try if you want. Small tip: “Don’t pay more than 150-200 UAH depending on where in the city you go”. There is rarely something more pleasant after a long trip and strict Ukrainian customs than seeing your name on a board held by a friendly driver waiting for you just behind the arrival gates. You have to book this service in advance. Among many companies, it is Grata that provides Kyiv airport transfers to/from Boryspil at a reasonable fixed price – 200 UAH.